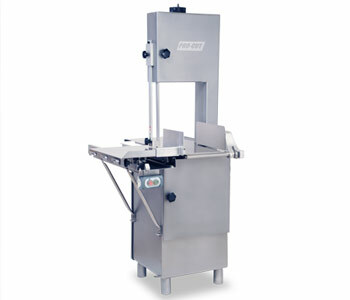 Pro-cut KS-116 PROFESSIONAL MEAT BAND SAW . Manufactured on stainless steel with sealed bearings, you can wash down your unit in just three minutes after a long work day. This will assure a long life for your meat band saw. You can use different blades depending on the product that you desire to saw. Blade tension is as simple as turning an internal knob. Maintaining cut width is easy by following its grading ruler etched on the stainless steel sliding table.